I smoke ribs, pork shoulders, turkeys or chickens just about every weekend. I love tinkering with the recipes, the techniques, and shoot, I like building a fire and providing for my family (including my dog family. 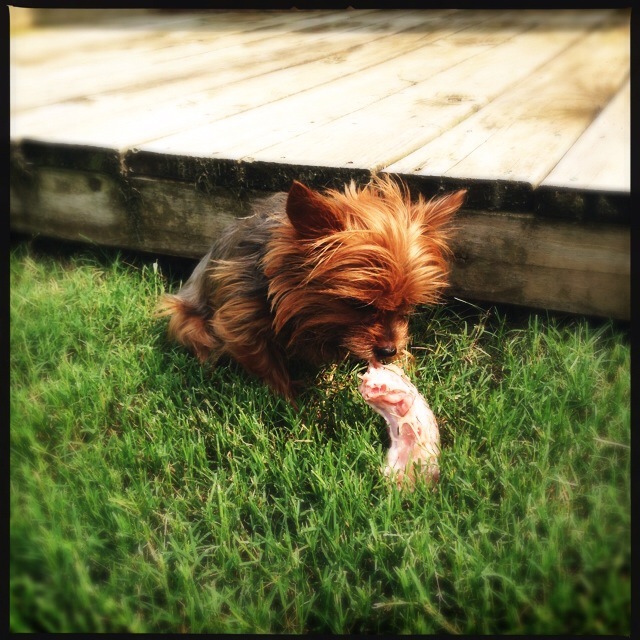 That’s Farrah eating a raw turkey neck). I would have made a great caveman. Over the last few years, I’ve had plenty of missteps: overcooked, undercooked, what-do-I-do-nows, and the like. 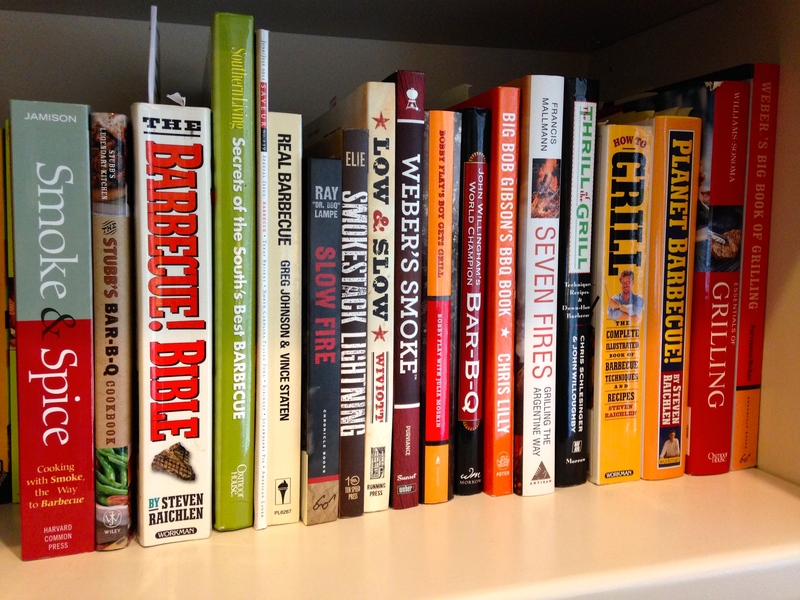 But by reading through my many books on BBQ and smoking (I’m now up to 19 dedicated BBQ or smoking cookbooks! ), searching through web forums, YouTube videos, talking to folks, and closely studying the competitors on BBQ Pitmasters, I have slowly gathered together a set of tips, techniques and tricks to get BBQ that I am proud of. My BBQ and smoking cookbook collection. Overall, I have several hundred cookbooks. We’ll start with everything I know about smoking ribs. I’m calling this a master class, because I’m putting it all out there: every technique and trick I’ve learned to make the best smoked ribs I can produce. You’ll generally find three choices: baby back ribs, St. Louis style ribs, and country style ribs. Baby back ribs come from high up on the side of the hog, right up near the spine. 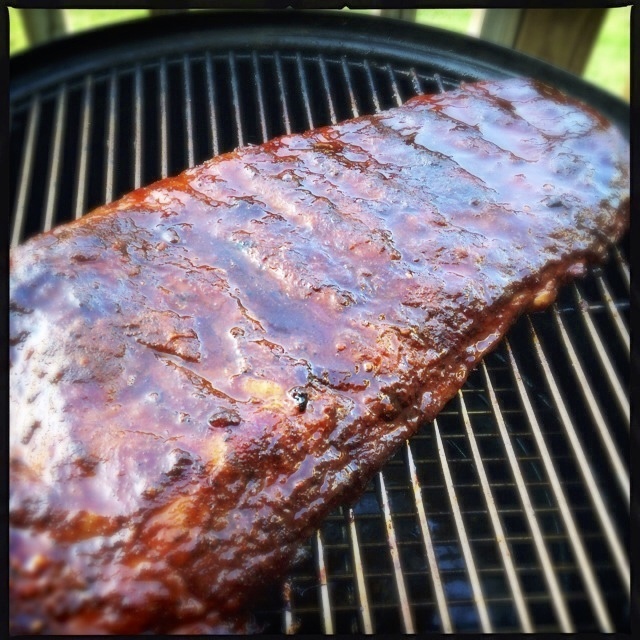 St. Louis style ribs are the continuation of the rib after the baby backs, closer to the belly of the hog. 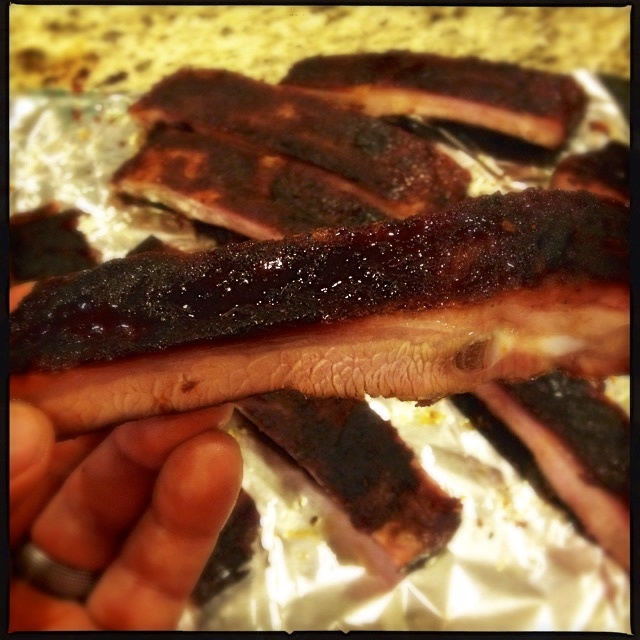 You may also find rib tips, which are the very end of the rib, after the St. Louis cut. 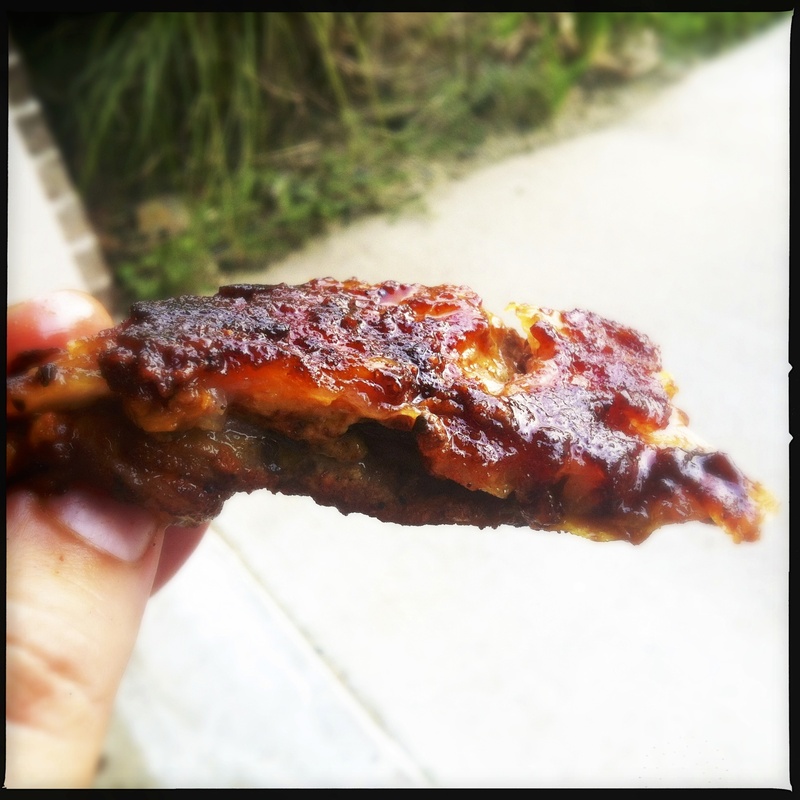 The St. Louis style ribs and rib tips are known together as the spareribs. 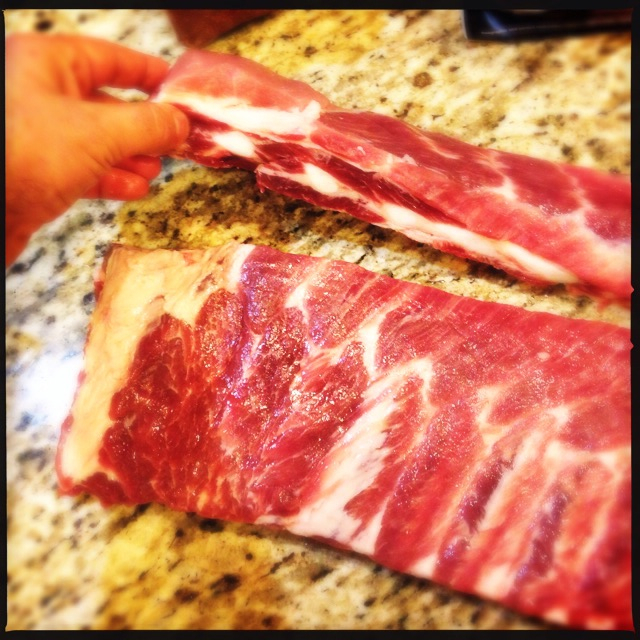 Some markets just sell the spare ribs, which you can cut down into St. Louis style ribs, as I discuss below. Country style ribs aren’t ribs at all; these come from the very front of the spare rib area near the shoulder. They are a flat blade of meat, about an inch thick and lack ribs entirely. Any bones in there are likely from the shoulder itself. Amazing ribs has a nice diagram showing all of this. I recommend you choose St. Louis style ribs for your first time out, or go with baby backs. I think you get more rib for your money with St. Louis style ribs, and if you watch the barbecue shows, that is the cut they use. Here’s what a St. Louis cut looks like, trimmed down from the spare ribs. I buy my ribs in cryovaced three pacs at Sam’s Club. It works out to be about $10 per rack of ribs. 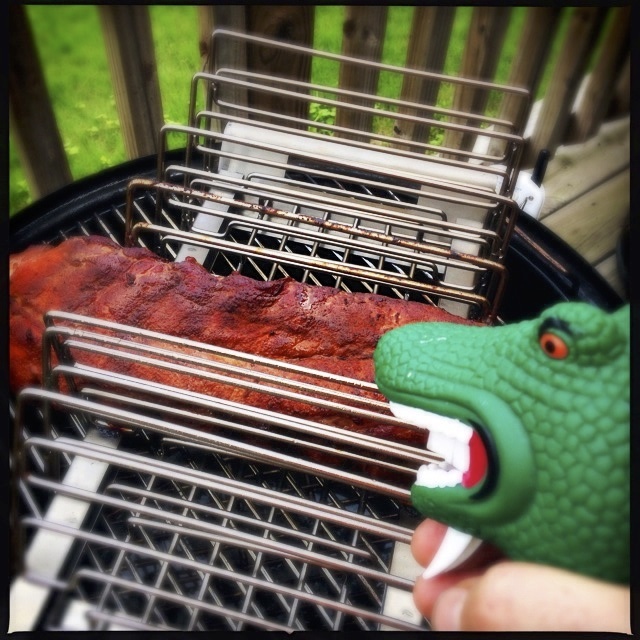 A rack has about 15 to 16 ribs, give or take. In an average meal where side dishes are served, you can feed 2-4 people off a rack of ribs, but count on 2-3; you are going to make some dee-licious ribs. So, if you are cooking for a party, a single cryovaced pack of three ribs will feed approximately 6-9 people. When you get your ribs home, open up the package over the sink. I like to rinse off meat, but I know that opinions differ. In any event, you will be cooking this beyond any food safety temperature issues. You’ll want to trim up your ribs. 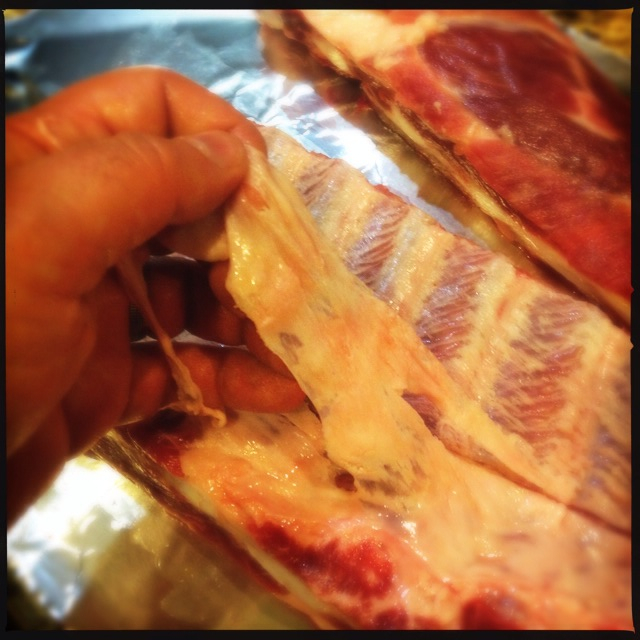 If you are using baby backs or spare ribs, just cut away any large pieces of white fat on the top of the ribs. You really don’t want to be biting down on that, in the end. 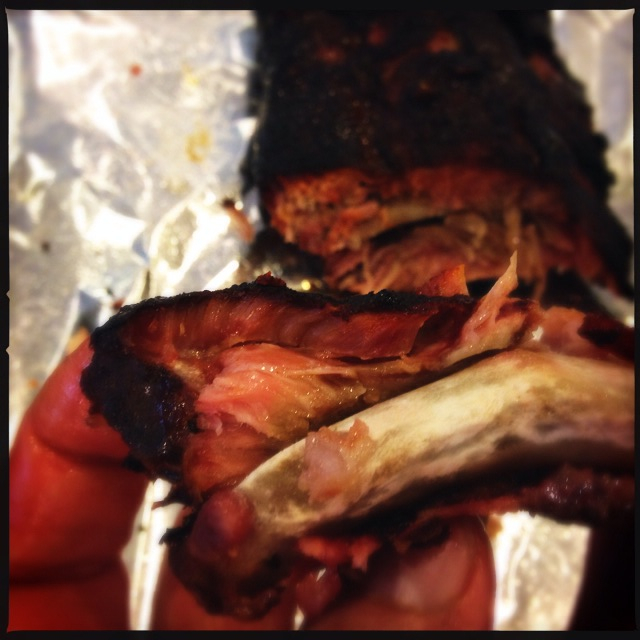 Also, the very best part of the rib is the area where the bark meets the smoke ring. If that bark is sitting on a layer of fat, it just tastes greasy, instead of deliciously meaty. So trim it up a bit. 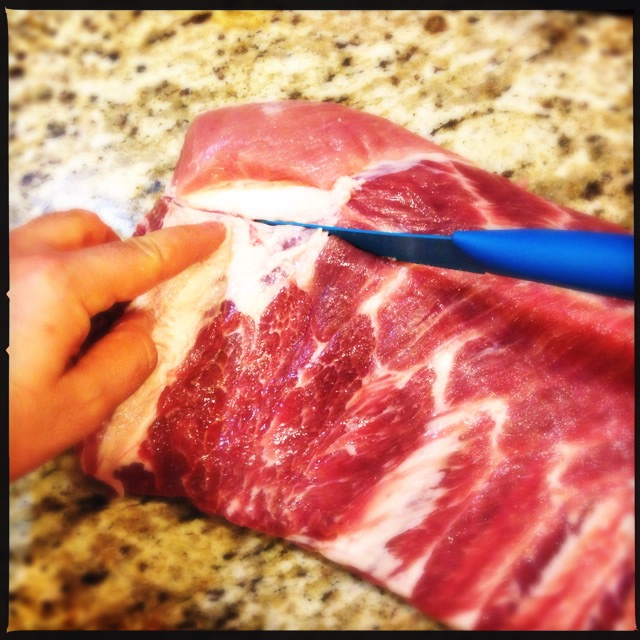 If you are using spare ribs, you should trim them down into the St. Louis style cut. With spare ribs, there is more fat to deal with. You’ll see a thick layer of fat and meat on the top, almost like a flap over the meat. I like to trim that off. There’s some on the underside, too. When you look at spare ribs, it is more or less a soft triangle. You’ll want to square them off as well; well, you’ll really want to rectangle them off. (Now, I have smoked the whole thing, but it presents a lot better in a crowd, if you rectangle it off.) That trimmed rectangle of ribs is the St. Louis style cut. Here’s how to do it. So, you’ll cut away maybe three or four inches of the spare ribs that are closest to you. Those are the rib tips, and you can smoke them if you want to. I do. 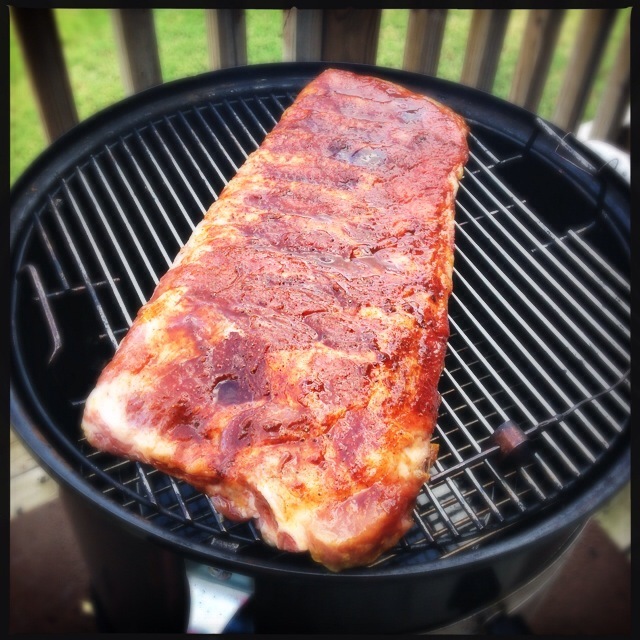 Now, no matter what ribs you have, flip them over so the curve of the ribs is concave, like a shallow cup. There is a membrane that covers the back side of the ribs. 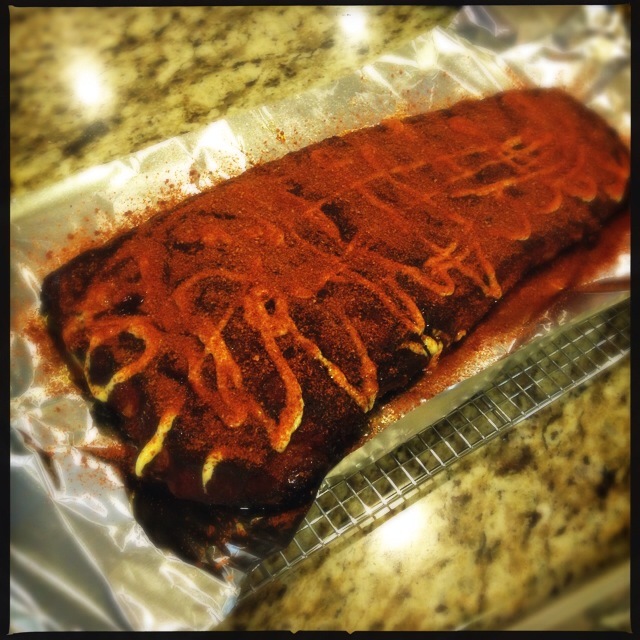 You’ll want to remove that, because it ends up turning dry and papery, like waxed paper, when the ribs are smoked. Some BBQ joints don’t remove it, and I always find that irritating…like they just didn’t care enough to not have me eat that papery membrane. So I always remove it. Take a butter knife, not a sharp knife, and grab a paper towel. You want to find the meat space between the last two ribs, and ease the butter knife in between those ribs, flat up against the back of the meat—don’t cut into the meat. You want to get under that thin white membrane. Once you have it lifted up a bit, grab it with your paper towel and pull down towards the other end of the ribs. You may have to try this a few times to get the hang of it. Get all of it off of there. So by now you have a set of clean, trimmed ribs. Time to rub them. You can use any rub you like, but since we are smoking these, you want something with a little more salt than sugar. Think savory. If it is too sweet, it will have a greater chance of burning…and we will finish these with sauce in the end, so if you like sweet, that is the time to add it. My standard BBQ rub is good for this. You want to get the rub to stick. Just rubbing it on will work, but it is better to have some sort of binder. One great binder is good old yellow mustard. Don’t worry if you don’t like mustard; you can’t taste it in the end. (I didn’t think I liked mustard on meat either, until I made Anthony Bourdain’s carre d’agneau au moutarde one time, and it blew me away…that is a rack of lamb with herbs and mustard crust.) Another great binder is oil or cooking spray. 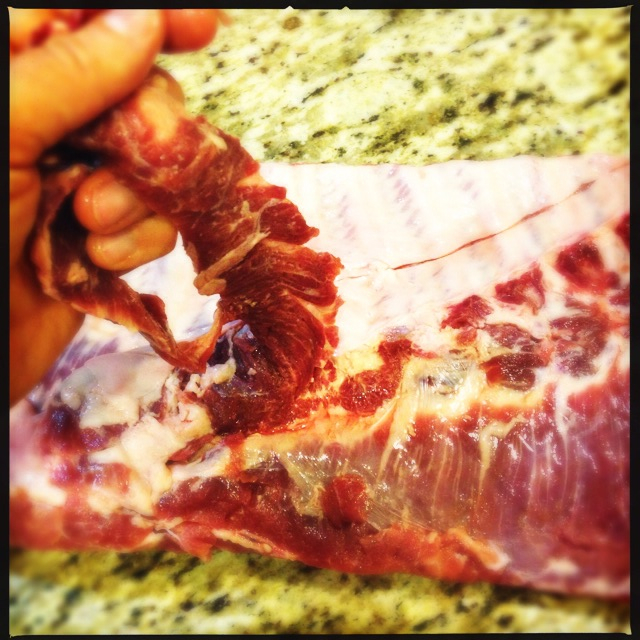 Turn the ribs so that the bottom of the ribs are facing up. Spread the mustard or oil in a thin layer across the ribs. 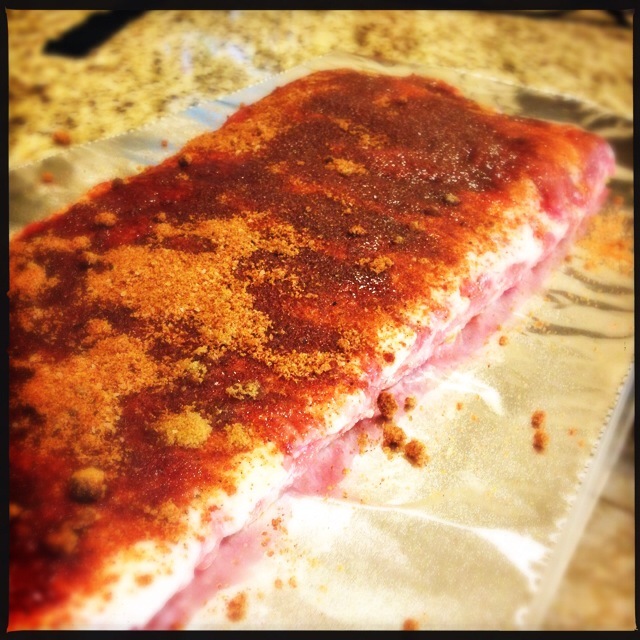 Smooth it out with your hands, and then sprinkle on the rub nice and evenly across the ribs. This is a messy operation; I like to spread out the mustard or oil and rub it in, then wash my hands before I add the rub. With the rub, you want a nice thin layer. You can spread the rub over the ribs with your hands, but I don’t like putting my hand back in the bowl of rub—I want to keep it clean so that I can use the remaining rub the next time. What I use is a shaker. I have tried the sugar shaker like the kind you find at a diner, but they don’t have an airtight cap. So I use an empty shaker from one of my spices. 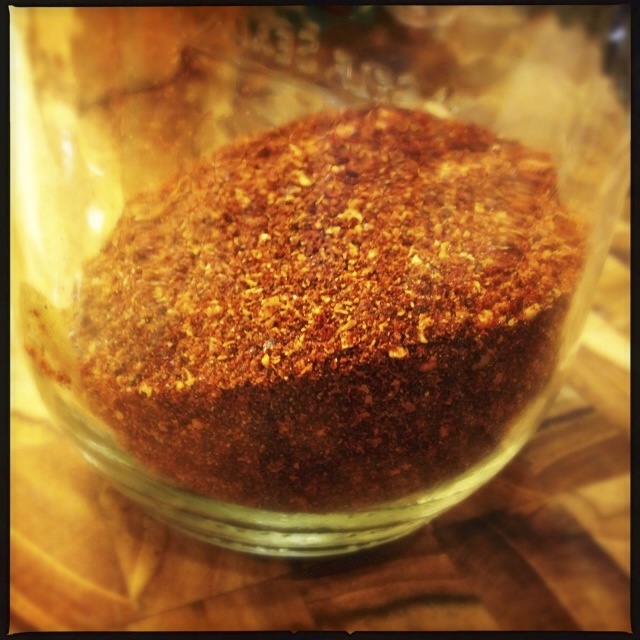 (Making rub, you will end up with a lot of spice bottles.) This type of bottle is easy to shake to break up any sugar clumps, and has a closable shaker top. And it keeps the leftover rub clean. Once you have a layer of rub on the bottom of your ribs, I like to pat it in. Not really rub it, but sort of let it know it is doing a good job. That kind of pat. Then flip it over and do the same on the top of the ribs. I like to let it sit in the fridge for the time it takes me to choose my wood and get the fire going, say 20-30 minutes. Choose your wood. Think Fruit and Backbone. You can buy smoking woods at many grocery stores, home improvement warehouses, and even sporting goods stores. If there is bark on the wood, try and chip it away. I like to smoke pork and chicken with fruit woods, like cherry and apple. They have a nice light, sweet smoke. I pair the fruit with a wood that has more backbone. 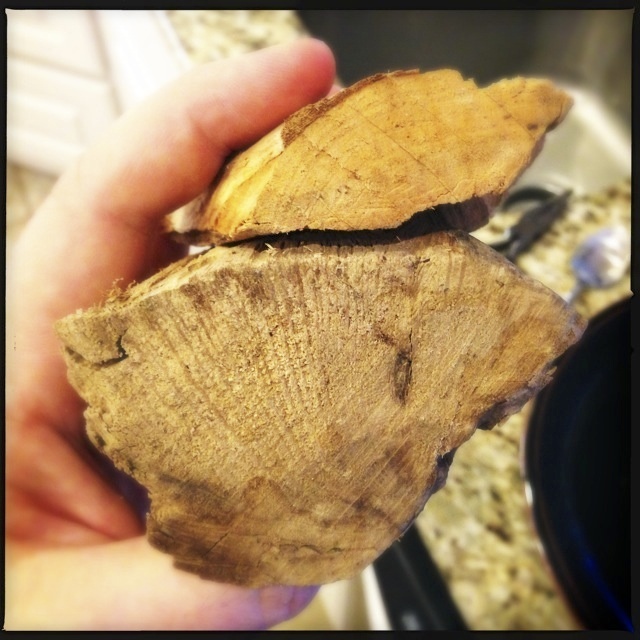 I use oak and pecan for backbone. These are mild-flavored woods that give a good smokiness without spice. Hickory makes dark-colored ribs, and is nice for times where I need to hit the ribs with more color and spice. I prefer to go more mahogany, so I don’t use hickory that often. What size you use depends upon what type of smoker you have. 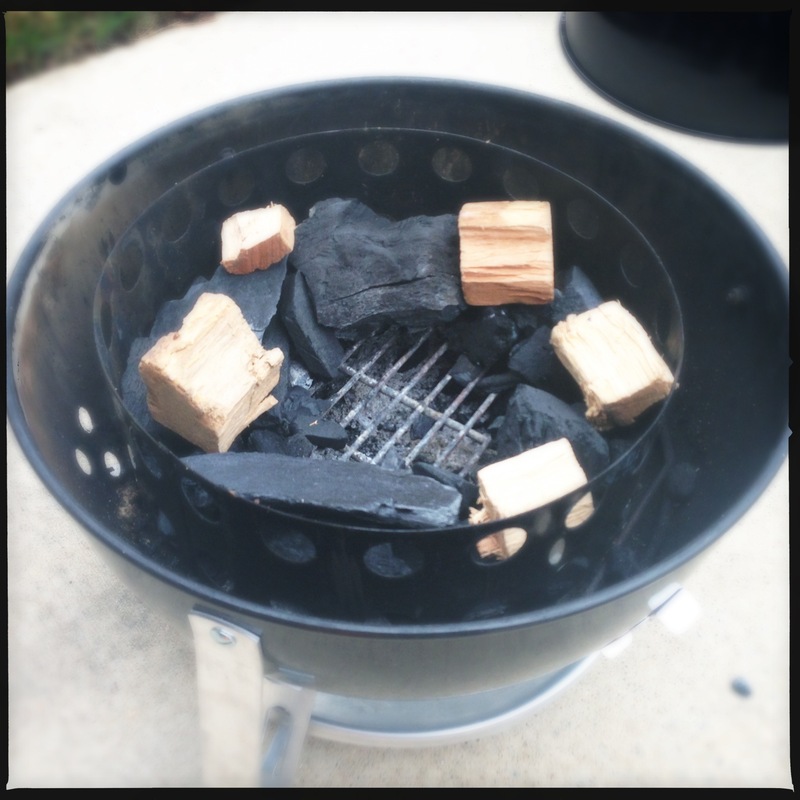 Before I bought my Weber Smoky Mountain, I “smoked” using wood chips in a smoker attachment on my gas grill. It never really worked out that well. If you have the ability to buy a smoker, go for it. It is engineered for that job, and will do it well. I prefer to use 3 or 4 wood chunks, each about 3-5 inches in size. You don’t want to use chips in a real smoker—they’ll be gone in a wisp of quick smoke. I use a modified Minion method to start my fire. (If you have an electric smoker, or a smoker with a sidebox or different setup, use what works for you.) I place a ring of charcoal in the bottom of my smoker, in a donut shape leaving a nice, wide empty space in the middle. I put the smoking woods on the top of that ring in a circle. So, think coal donut with wood sprinkles. I light my coals in a charcoal chimney and let that heat up for a good 10 minutes or more. You want to get the coals white hot. Once the coals are hot, I pour them into the center empty space of the coal donut, filling that empty space. 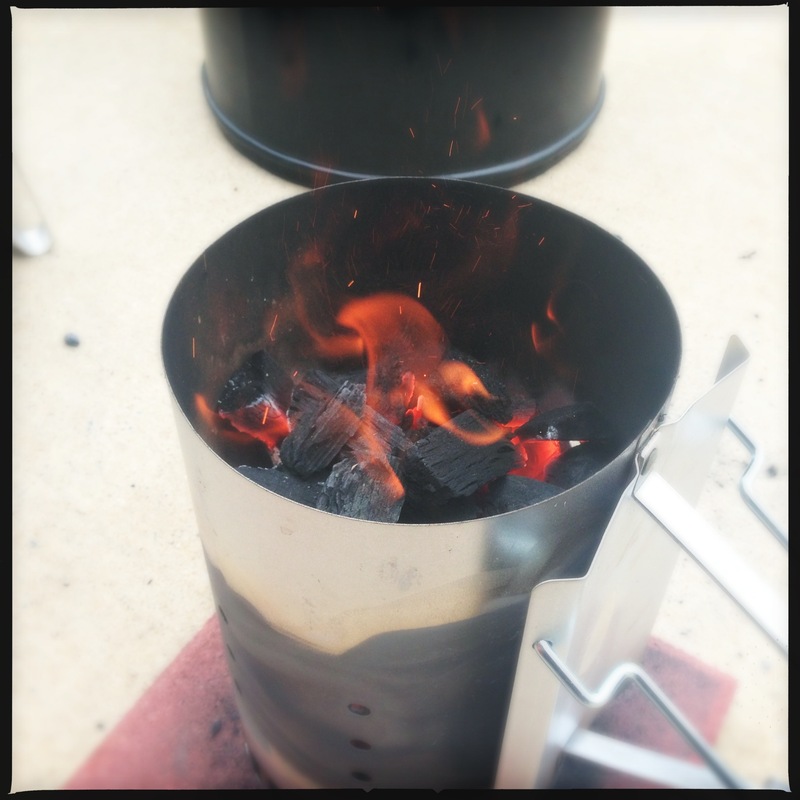 The reason you use this method is that it allows your smoker to slowly and evenly consume the charcoal. If you just filled the bottom of the smoker with cold coals and poured hot coals on top, you would have a blazing hot smoker that would go way above the needed 225 degrees and burn itself out. 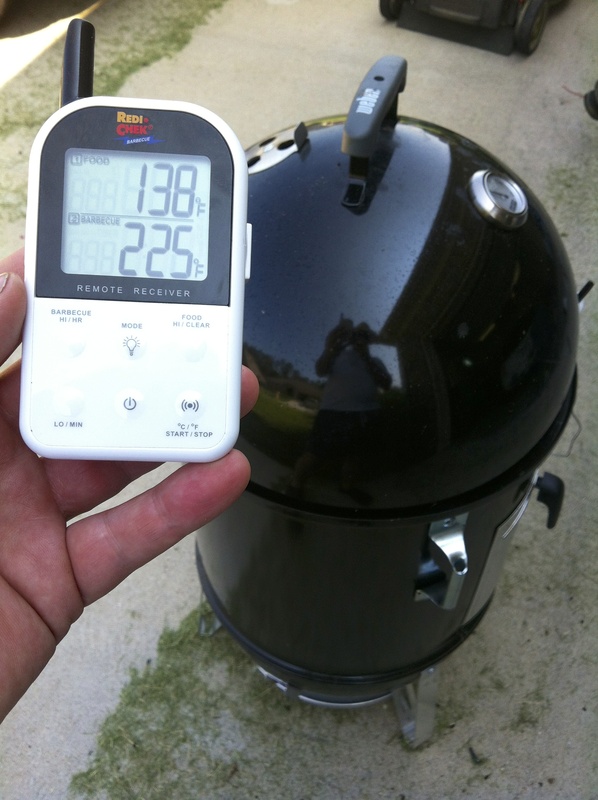 The modified Minion method allows you to go low and slow, keeping your temperature at a nice even range throughout. Once your fire is ready, you are ready to smoke. Pull your ribs out of the refrigerator, and lay them on the smoker face up. This is a rack I bought at Williams-Sonoma. You don’t need a rack for one set of ribs, unless one is too large for your smoker. After three hours, pull your ribs off of the smoker and take them inside. What you will do now is to wrap them tightly in tin foil and throw them back on the grill for two hours, to really get them tender. But since you have them off the grill, it’s a perfect time to add more flavor. In the BBQ competition world, stealing an idea from another man is called a shig. This shig is from the very best rib cooker in competition history, Johnny Trigg. So yes, this is a Johnny Trigg shig. And here’s how you do it. 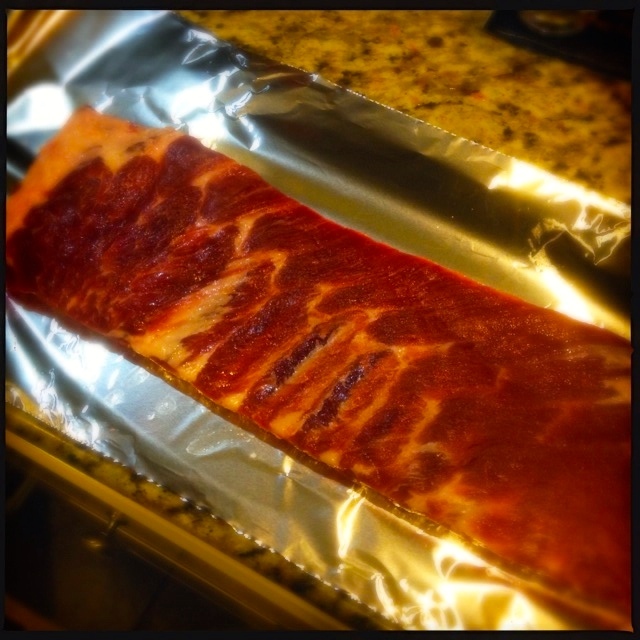 For each rack of ribs, lay down a long piece of tin foil, about 4 inches longer than your ribs at each end. Curl up all four sides a little bit so that the next part doesn’t leak out on your countertop. Squeeze a wave of Parkay margarine down the center line, sprinkle about 3/4 to 1 cup of brown sugar over the butter, squeeze a wave of honey down the center line, add a line of Tiger Sauce, and then lay your ribs face down on the foil. 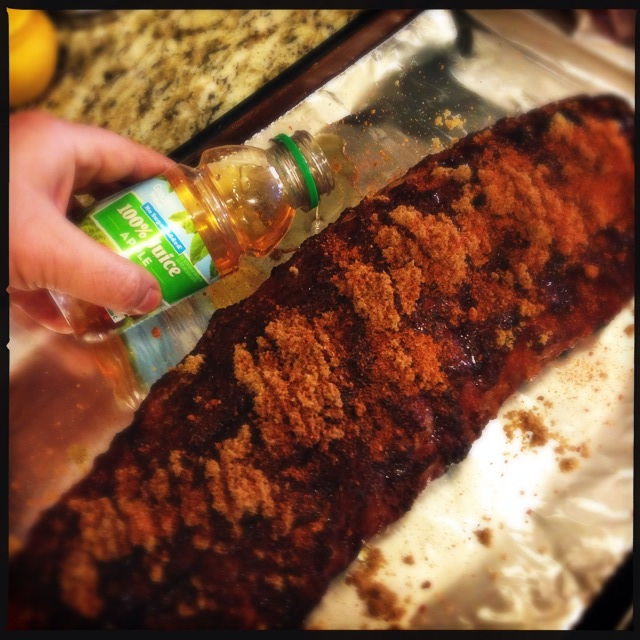 Do the same margarine, brown sugar, honey and Tiger Sauce to the other side of the ribs, add 1/4 cup of apple juice, lay a second piece of foil over the ribs, and seal it up tightly on all sides. 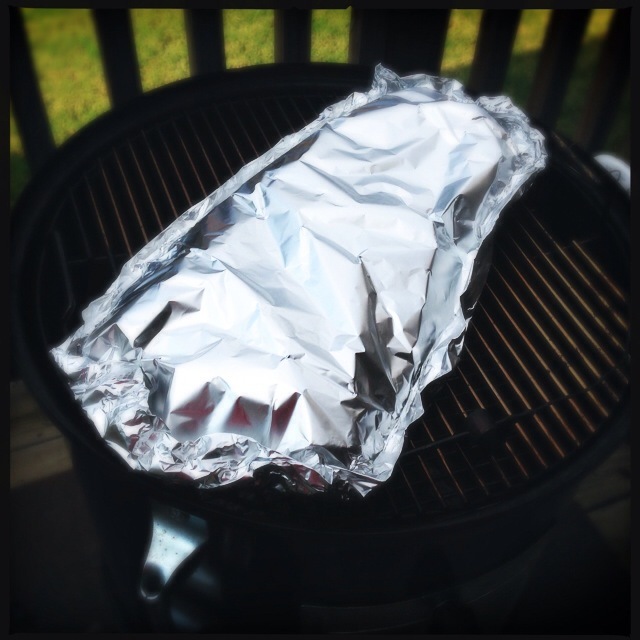 Place this foil packet back on the smoker, keeping the ribs face down. Smoke the ribs for another two hours. When the first five hours of cook time are up, take the ribs off the smoker and very carefully open up the foil packets. Place the ribs back on the smoker face up, and glaze the ribs with barbecue sauce. It’s ok to use a sweet sauce here, because it won’t burn in just one hour. Take them inside, let them rest for a few minutes, and then cut them into single or even 4-rib portions. Take a good look at the smoke ring, and feel proud that you did that. This is a correctly cooked rib. The meat is not falling off the bone. You can reglaze them with your favorite BBQ sauce before serving. Andy, I can’t wait for you to try it! I just picked up some spareribs to smoke tomorrow. Perfect weekend for it! I think I will plan on ribs next weekend! They are so much easier and less time consuming than brisket. You’re right, Andy! No 12-16 hour cook required here. And, so long as your smoker keeps an even temp (which your does very well), you can set it and forget it, and just check back in at the 3-2-1 points. I usually throw it on in the morning before doing yard work (which is what I’m doing today) and you’ll have great ribs by mid-afternoon. Good luck and let me know how it goes! Generally always beeewtn 225 275 is your cooking range Ribs 4 6 hoursBrisket 8 16 hours on smoker fat side up can finish in oven after 8 hours if neededFish under one hourMy favorite chicken wings 2 hours on the smoker and mix with homemade wing sauce and dipped in blue cheese.